The Graco E-10 is a small and ready to go reactor, perfect for smaller scale jobs and finishing work. This reactor helps you tackle those small jobs fast and with precision, without giving up the level of performance that is required from your trusted Graco equipment. The Graco E-10 Reactor is ideal for plural-component spray, touch-ups, and joint fill jobs. This reactor model is designed to be easy to use with a fast setup because of its smart controls. The Graco E-10 is sure to be a perfect fit with your other proportioning equipment. The Graco E-10 reactor operates with a max working pressure of 2000 psi, a max hose length of 105 feet and a max fluid temperature of 160° Fahrenheit (71° Celsius). Output is guaranteed at 212 pounds per minute, and the weight is 150 pounds, and when heated, roughly 160 pounds. Standard recommended applications for foam insulation jobs include finishing work on rim joists, patches in spray foam roofing applications, repair of windows and general project preparation work. The Graco E-10 is also perfect for smaller industrial and commercial projects - joint filling in concrete, applications for flooring, cold spray polyurea using small tank sprays and general maintenance. 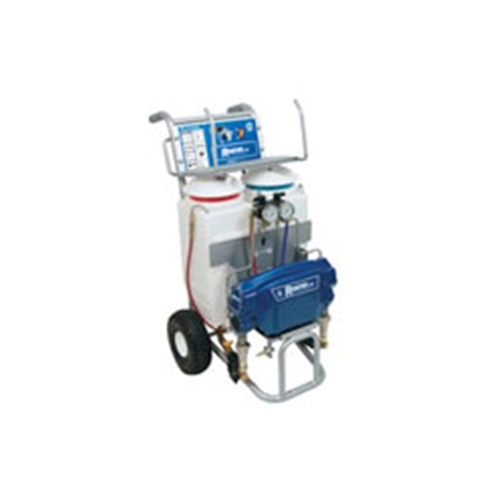 Overall the Graco E-10 reactor is a great addition to any spray foam operation, and allows for access that would be restricted in difficult to reach areas, as well as areas that require completely portable equipment. The versatility that results from being able to spray cold and hot as well as foam, makes this a great alternative to disposable systems. In addition to spray foam applications, this reactor is also widely used in commercial flooring projects, as well as in texture and painting for both residences and businesses. Shop all Graco at Intech, place your order today, and deploy the Graco E-10 on your jobsites!